Arrived Santo Domingo and met with mucho mucho aqua. Rain pouring lard and fast. Some streets are not set up for so much at one time and so there is a lot of water all over the roads. A bit dangerous, but not as dangerous a some of the drivers around here! As you can see my wonderful husband Scott makes friends where ever he goes! First thing out of the gate he asked a guy for a ride on a chonco. The man is fearless! So I've posted some shots of my stunt man and some shots of the rain. We just arrived in Santo Domingo we have a meeting tomorrow with Febeka. She is a Dominican friend and business woman that has a heart for children and wants to help us with our fence. She is a wonderful woman and has built a business school in Santo Domingo. We will visit her tomorrow at her school. We are so very thankful to have her help us - she is also going to take us to look at a vehicle. Currently we rent a car, but buying one could work out better for us. In the meantime our concentration is organizing and funding our fence. It is so very import at this time to fence the school. As we have more and more children per teacher is in critical we maintain the safety of the children. The children are 3 - 8 years old and they are used to running around the village. It is not unusual to find a child very far from home as they chase and play with other children. The same happens at school. Sometimes one wonders away sight unseen! 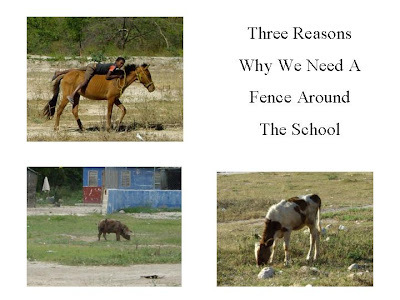 There are many reasons we need to have this fence built for the children. The area is very danderous especially because there is an irrigation canal which runs behind the school. The children play in it. Most of the time the canal is dry, but when the water is turned onto water the crops the water comes unecxpectedly and rushing very quickly through the canal. There is a great potential for a child to be hurt there. Also the children's play area is overran with animals, goats, cows, horses, turkeys and pigs. What they leave behind is not good for our health and wellness program. Once the fence is complete and our area is secure we will build a small kitchen to feed the children. Currently we cook at the mission house and walk the food over, the children eat in shifts in our little "clinic" room. Once we build the kitchen we will build an outside covered eating area where all the children can eat together. The area will double as an gathering area for parent/teacher meetings, adult education classes and our continuing health and wellness classes taught by our mission teams. We plan also to plant fruit trees once the area is secure. We can have bananas and melons for the children to eat. Plus teach them how to grow their own food. The final bonus of having a fence is simply to define our area and keep it clean. Teach the children to take care of their space and setting an example for the entire community.